Well ... there are some Danish guys ... and they say, they re-invented the eBike. Well first of all, since I'm an actual cyclist and actual mean, I'm aware of the fact, that I have to pedal, when I want to get somewhere, I disagree with these bloody eBikes. Reasons may (or may not) follow later. 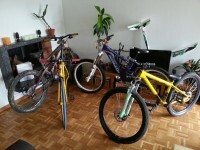 I'm not a fan of eCar and guess about eBike? Now this is a thread!! This is my daily Driver, Evil Faction, with Front and rear 160mm Formular hydros and a 1x9 setup. This is my 09 GT Sanction 1.0 with many DH/FR orientated mods. 1x9 driveline, 200mm disc up front with a 180mm at the back. DHX3.0 coil shock, new chaindevice and a bombproof Wheelset. 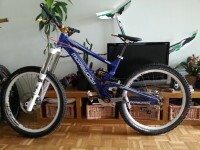 I've had this for about 4 years now, and it does everything from Uetliberg to PDS to Lenzerheide. to sell it because of a bad hand injury. Fox 180 at the front, Canecreek DoubleBarrel at the back. 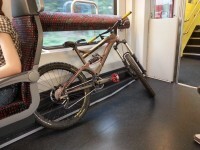 You can also see my Specialized Langster there which is, in the summer, my commuter bike. If anyone else here is into bikes, post them up We can also organize some biking trips out. I really hate these retard ebikers that really don't know how to behave in traffic and then they can even ride with decent speed! Add to that the number of people who ride with headphones in, no lights and dark clothes at night etc etc. There are quite a few people that are seriously crazy here in Switzerland ... when it comes to having a set of two wheels without engine underneath the thing they actaully are. Damned hell ... I love your collection mate! Can a bike thread be complete without stacks? Sure I have some nice bikes, and sometimes I can even ride them well. edit: Youtube links don't work? ?